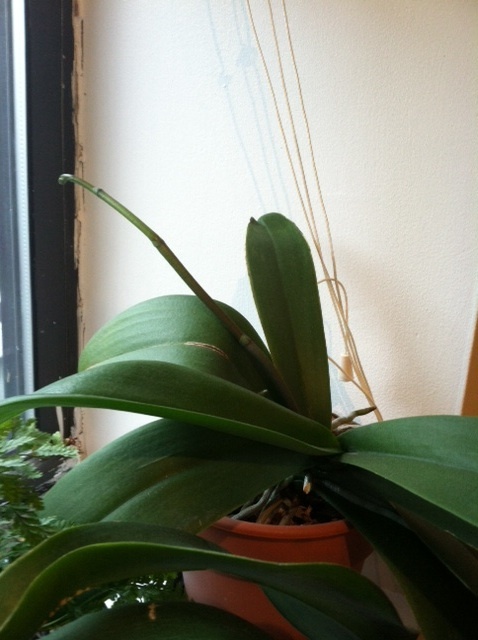 In my latest update on what’s going on with my orchids, I mentioned that one of the Phals I’m growing at my fiancé’s office is in spike. I had accidentally deleted the photo of it from my phone, so I took another pic yesterday—and it’s growing like a weed! It’s funny how much faster these things seem to grow when you don’t see them day in and day out. I moved the pot back from the window to allow more room for the spike to grow; the tip of the spike had started to bump up against the window and curve under. We’ll see if the small change in location affects how the buds develop. I need to take a stake and some clips the next time I go to the office so that I can secure the spike. It seems to be quite a happy plant! Too bad it won’t be in bloom by this Thursday…we’re throwing a little engagement party at the winery that evening and it’d be fun to show off to friends and family. What could be in bloom by this Thursday, though, is my Oncidium Pacific Sunrise ‘Hakalau’ that I also mentioned in my most recent update. The buds are coming along nicely and one of them looks close to opening up! Sooo excited for these to open! I keep mentioning Thursday, but that’s not just because of our engagement party. Thursday also happens to be my 35th birthday (eek! but also exciting!). So, little orchid, please give me a nice birthday surprise on June 13! It would make my day even better. ← Last Day for Green Thumb Club Special Offer!